We are approaching one of Durango’s most beloved winter celebrations—Snowdown. January 30-February 3, Durango becomes an exciting winter festival. This year’s theme, “Get Your Comic On” will surely be a blast. The Wells Group is excited to be a sponsor for the Snowdown Bed Race on Friday, February 1 at 4 pm. Groups of 5 people (4 pushing and 1 on the bed), will race down and back Main Avenue, changing their comic-con “onesie” halfway down with the person on the bed. 24 teams will compete for the title, and all proceeds benefit the 100 Club of Durango. Races will be head-to-head, single elimination, where the fastest team moves to the next round. This all occurs before the traditional Snowdown Parade, so downtown Durango will be a fun place to be that evening. If you are interested in racing, registration is open until January 20 at the following website: https://snowdownbedrace.eventbrite.com. The beds are already built, and sponsors are allowed/encouraged to decorate beds with promotional information for their businesses. 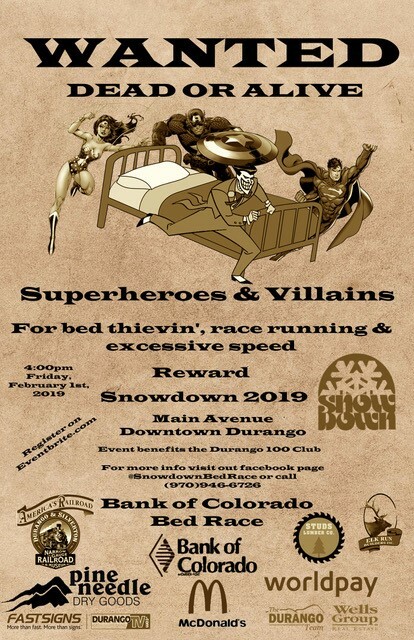 With the snow Durango has had this year and the location on Main, the Bed Race will be an event you won’t want to miss. We are excited for Snowdown and hope to see you at the Bed Race!